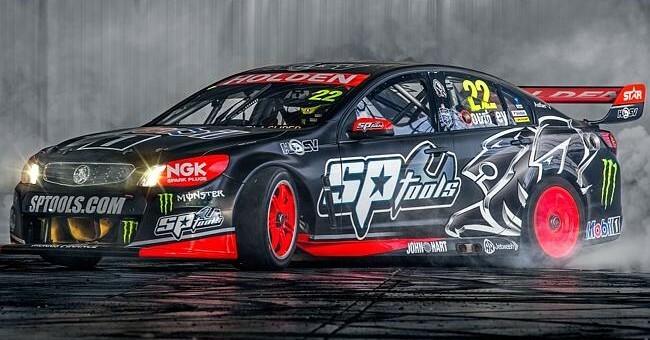 Holden Racing Team has unveiled an all-new black livery ahead of February’s V8 SuperTest pre-season run. The team also announced a new partnership with Monster Energy for the 2015 season, marking a return to the energy drink’s team for HRT driver James Courtney. The Holden team will run a variety of different livery designs throughout the 2015 season on both Courtney’s and teammate Garth Tander’s Commodores, marking HRT’s 25th year in V8 Supercars competition. The team is also expected to run their ANZAC tribute livery in a race to commemorate the 100th anniversary of World War I’s Gallipoli landing. Holden says they “expect to be at the front consistently” this year, as they look to add to their record six V8 Supercars championships. The 2015 V8 Supercars season will start when the green flag waves on the first race of the Clipsal 500 in Adelaide on February 31st. Sorry, but they won’t be anywhere near the front as consistently as they say. Not while 888 have Whincup, Volvo have Scotty Mac and PRA have Mostert!